We are a meat loving family. It’s a struggle for me to get a meal on the table without it containing a good amount of animal protein. 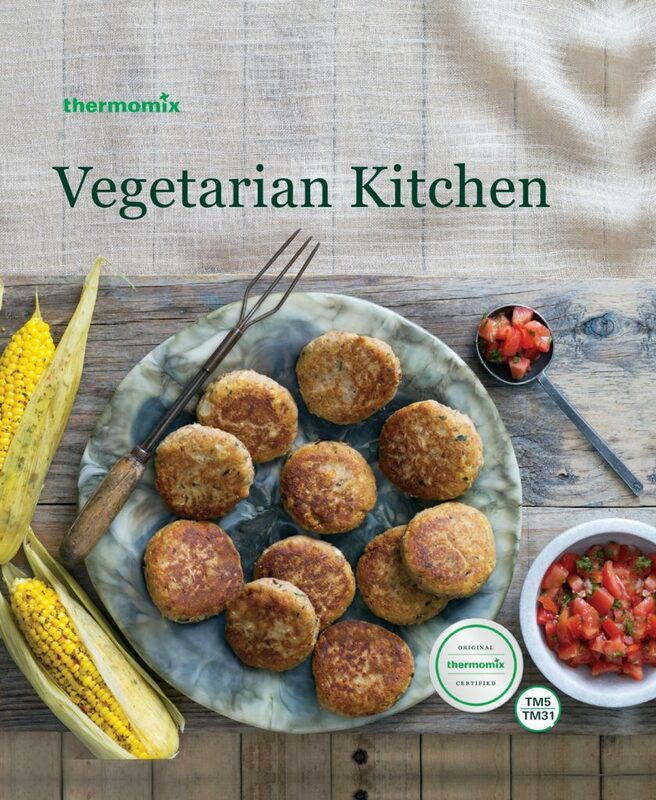 Despite that, I have always considered the Thermomix vegetarian cookbook one of my favourites. Because, even though we enjoy our meat, we also love vegetables, good nutrition and wholefood cooking. I was pretty pleased then when I heard that Thermomix had released a new vegetarian cookbook – Vegetarian Kitchen – featuring over 90 recipes and most of them new. It still includes a few of the classic recipes from their previous A Taste of Vegetarian, such as; Almond Milk, Vegetable Lasagne and Cashew Sour Cream, but most of the 90+ recipes are newly released. Like all of the latest Thermomix cookbooks, Vegetarian Kitchen comes in the larger format with prettier pictures and the option of the Recipe Chip for TM5 owners. All of the recipes are suitable for both TM5 and TM31. You can view the index here. There is a focus on nutritionally balanced meals to ensure that if you do follow a vegetarian diet, you are still getting all the vitamins and minerals as well as the fibre you need. The book is considered lacto-ovo vegetarian, and whilst it does contain some vegan/dairy free recipes or alternatives, there are a lot of recipes that contain dairy and gluten. So for those who avoid these foods you wouldn’t be able to cook everything from the book. Special thanks to Thermomix who have allowed me to share this delicious dish; Cauliflower and Fennel Nuggets. Both cauliflower and fennel are in season and these tasty nuggets are great in lunchboxes, as an appetizer or in a middle eastern style salad for lunch or dinner. The Avjar is a relish style sauce with a smokey flavour. It is a delicious sauce to serve at BBQ. Preheat oven to 200°C. Line a baking tray (30 x 40 cm) with baking paper. little oil and bake for 30 minutes (200°C). to steam for 10 minutes. Peel off skins and discard. Place garlic, chilli, olives and parsley into mixing bowl and chop 3 sec/speed 5. Scrape down sides of mixing bowl with spatula. Add oil, salt, paprika, lemon juice and reserved capsicum and eggplant, then chop 5 sec/speed 4. -6 min/Varoma/ /speed , placing simmering basket instead of measuring cup onto mixing bowl lid, until mixture thickens. Transfer into a sealable container, allow to cool to room temperature, then place into refrigerator until ready to serve. Clean and dry mixing bowl. Place water into mixing bowl, place Varoma into position and weigh cauliflower and fennel into it. Secure Varoma lid and steam 10 min/Varoma/speed 2. Set Varoma aside and discard water. Dry mixing bowl. Place cooked cauliflower and fennel into mixing bowl and chop 5 sec/ /speed 5. Transfer into a bowl and set aside. with cauliflower and set aside. Place spring onions/shallots, parsley, garlic and oil into mixing bowl and chop 5 sec/speed 7. Scrape down sides of mixing bowl with spatula, then sauté 3 min/100°C/speed 1. Add remaining ingredients, excluding lemon wedges, including reserved cauliflower and cheese, and mix 10 sec/ /speed 4.
place onto prepared baking tray. Repeat with remaining mixture to make approx. 35 nuggets, washing your hands occasionally to prevent mixture from sticking to your hands. Bake for 12-15 minutes (200°C), or until golden. 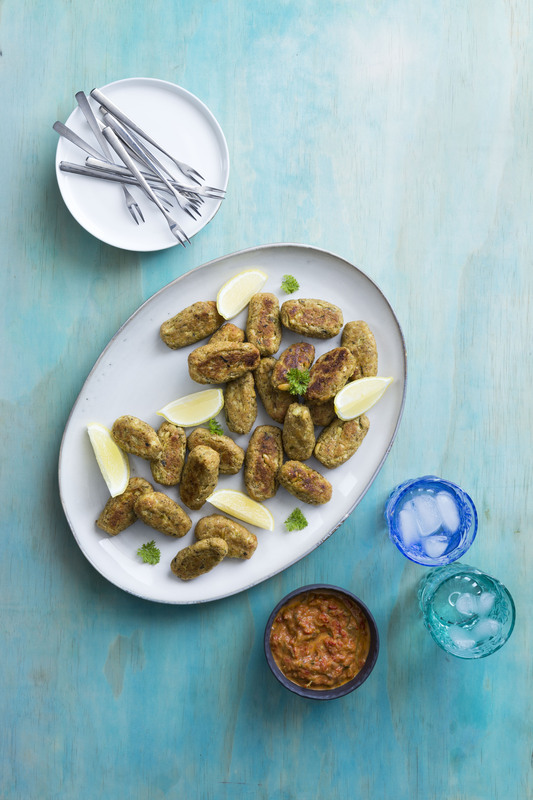 Serve nuggets warm with ajvar, lemon wedges (optional) and parsley (optional). I am so glad Thermomix has put out a vegetarian cookbook. I have had my thermomix for over 3 years now and have been a vegetarian for 15 years. I have had to convert alot of my vege recipes which has been quite tedious. I would love to try the Fathoush and Haloumi and very excited to be able to make my own Haloumi as my daughter eats it by the bucket load!!. Hope I am lucky enough to win a copy of the book. The Haloumi looks great doesnt it. It’s amazing what you can make with your Thermomix. I have had mine for six years and I say the learning never stops! My husband needs to start following a more vegetarian diet and as I use my thermomix most days this is going to be really helpful. First recipe I’m going to make is the “mixed mushroom congee with pickled egg” as it sounds amazing but it was a hard to choose I must say. Thanks for the above recipe also!